Weimaraners need hours of exercise everyday. The Weimaraner is a tall sleek dog with a whole lot of energy. These hunting dogs are powerful, intelligent and very loyal. 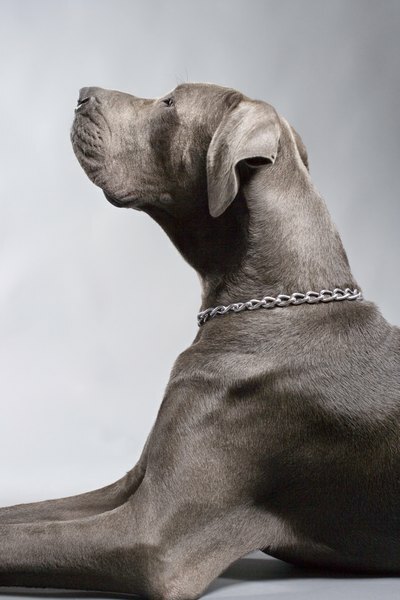 Weimaraners love their human families and will protect them from any and all perceived dangers, big or small. Exercise your dog for at least two hours everyday. This dog needs to run in a large fenced yard or other safe, enclosed area. Take the dog for runs outside the yard only while he is on a leash; these dogs will chase any small animal. Socialize your dog with other animals and people. Weimaraners are hunters and will chase and kill small animals including cats and small dogs. The breed is also instinctively suspicious of new people and can be aggressive if not properly socialized. Don't leave a Weimaraner home alone for long periods of time. The breed is prone to separation anxiety and can destroy a home in a fit of anxiety. Train your Weimaraner to be comfortable in a crate for the times when you do need to leave your dog unsupervised. Brush the dog and clean his ears weekly. Brush his teeth two or three times a week and trim his nails monthly. Bathe the dog every three or four months. Feed a high-quality dog food to your Weimaraner twice daily. Consult a veterinarian for the proper amount and for brand recommendations. Monitor your Weimaraner for common health issues such as hip dysplasia, bloat, von Willebrand disease and Factor XI deficiency, which are both blood disorders, and distichiasis, entropion and progressive retinal atrophy, which are all eye-related issues. Your veterinarian can help identify and treat these issues. Weimaraners are great escape artists, so watch your dog closely in the yard and check your fence often for weak points. How do Groomers Handle Aggressive Dogs?